This weekend we head to the Highlands for our Championship game against Ross County. Following their relegation last season, the hosts have made a good start to this campaign and as they aim to get back into the Premiership, sit second in the table ten points ahead of us. Our first game against the Staggies this season ended goal-less, when a resolute, and battling performance from Queens saw them earn a well deserved point at Palmerston in September. 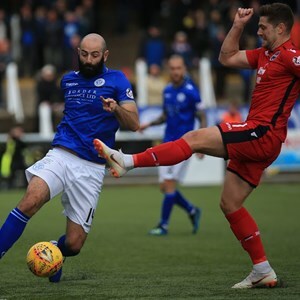 Although neither side were able to find a winning goal, Queens had the better of the chances and for large parts of the game they were well in control against one of the title favourites. Queens boss Gary Naysmith has been looking back on our win over Partick Thistle and ahead to the game against County. "I was happy with the win over Thistle as for me it was probably our biggest game of the season so far. With the end of the year fast approaching and the other fixtures last weekend, we wanted to make sure that we stayed within touching distance of the play-off places and we knew that a win would open up a decent gap for us over Thistle. So with those things in mind we knew how important three points were going to be and I'm delighted that the players ground out a fantastic result. It maybe wasn't our most attacking performance of the season, but we knew that if we kept it tight we would get a chance and that's what happened. As a team from back to front we were solid defensively, every player played their part in that. With the goal coming later in the game we had to make sure we managed the final ten minutes properly and although we got lucky at the end with their penalty claim, I felt the players performance merited the victory. This week, we head to Ross County, a side who are challenging at the top end of the table. It's no surprise that they have made the start to the season that they have, it's what I would have expected them to do. We know they are a good side and that it will be tough on their own patch but we can go there with nothing to fear. We more than matched them when we played them in September so we know that we can compete. Every team in the Championship is capable of beating each other, so while we will give them the respect that they deserve we're not worried about the game. Apart from Darren Brownlie, we were at full strength last week and it was nice to have everyone available for selection. Unfortunately that didn't last long, as will be without Stephen Dobbie due to his hamstring injury. After he limping off last week, he will definitely miss the next few games. It would be a blow to any team losing a player of Stephen's ability but it gives those coming in an opportunity". Tickets for the match which kicks off at 3pm on Saturday, will be available to buy on the day from the Matchday Ticket Office (portacabin) at the Global Energy Stadium from 11am right up until kick-off. For directions and other information about the Global Energy Stadium, please refer to the visitor guide on Ross County's website http://www.rosscountyfootballclub.co.uk. Where you will also be able to refer to their fans code of conduct and stadium regulations.